The man was no villain. The woman was all grace. It was a cruel time. Baishey Shravana literally means the twenty-second day of the Bengali calendar month of Shravana.Baishey Shravana in Sen's film merely happens to be the wedding day of an ill-fated couple, the man too old, the wife too young, the man almost uncouth to look at, the wife charming and aristocratic, both struggling to adjust with each other in their own way. Abject poverty in the face of a famine, and a desperate attempt to cling to their last glory lead to the wife's suicide on their wedding anniversary. In their life and death, Rabindranath Tagore, who was born on this date, was of no relevance. The film is based on poverty, famine, death, and a total erosion of human values. 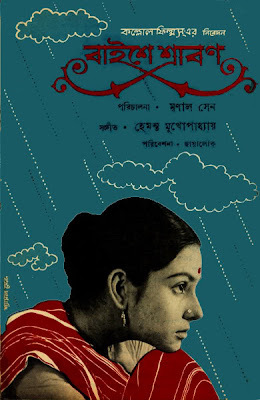 Nothing could have been more un-Tagorean!This is Mrinal Sen's cruellest film. We have seen anger, unrest, deprivation, and many other negative passions in his films, but in no other film are we faced with such oppressive, almost claustrophobic, atmosphere. In Baishey Shravana there is no redemption, no compassion. The famine enters silently, and one must give credit to Sen that he never shows the famine physically. 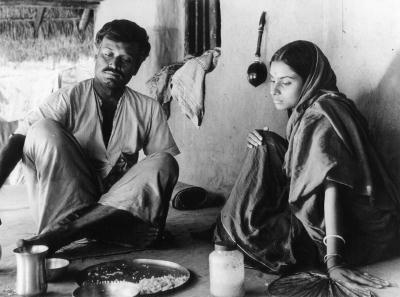 Just as he had established the war with the shot of a passing convoy and a flying aeroplane, he conveys the famine in the film by one long shot - villagers moving to the city in search of food. The important message of the film is that how poverty can rob a man of his last vestige of humanity, and bring him down to the level of a beast. Sen also took great care to ensure that the memory of Pather Panchali by Satyajit Ray should not eclipse his film. Ray's camera had painted on celluloid the absorbing beauty of Bengal's countryside; Sen chose to focus only on the faces of the villagers - no tree, no river, not even a flower diverted his attention. Baishey Shravana went to London and Venice festivals and earned rave reviews. However, the cruelty and the sense of doom of the film were intolerable for the audience at home as they were not prepared for the turn of the horrific events by the director. In Baishey Shravana, Sen was making a human document and he mostly succeeded in his pursuit. Hello author, or to who it may concern,.. as it was written "Tagore,who was born on this date ".. in this writing, make yourfact truthfully correct.. it is Tagore's Death Day..Depicting the human condition and saga of civilization'... A completely mis-discernment..
Tagore was born on 25 Baishakh and died on 22 Shravan. But it is also true that this movie has nothing to do with Tagore's death. The hero (Salesman) finally felt the need to get married and also wanted to see the smile on her mother's face who was desperate about her son getting married. The feeling of personal requirement and the responsibility to content the mother intersected and the old salesman married the young lady who was really adorable, charming and loving. The movie speaks about human relationship and how human relationship changes with time during difficult times. A man woman relationship might not always necessarily be a romantic relationship and Sen was never under the compulsion of thinking to make it a romantic movie, however we have seen few instances of romance that this ill-fated couple was blessed with though for a very short while until a jinxed phase take over them and gradually this takes them to a worst phase.The time was so cruel which forces human being to loose their humanity.